Letchworth Girls' Rugby: Women's rugby.... in 1928! Its buried away a bit on a rugby history blog. Apparently women's rugby - or at least a version of rugby - was quite popular in northern France in the 20s. You do wonder what happened to the game - it was a significant spectator sport, it seems - enough to warrant large posters advertising games on the sides of buildings (see left). There again women's football in England was also a very popular spectator sport at this time, so much so that the FA banned it! Maybe women's rugby in France suffered in a similar way? The blog suggests that the game filmed may be a version of rugby that the French called "barette", which theoretically did not allow full tackling but only "blocking" - it has been compared to touch rugby - but if that is so then going by this video it seems quite vigorous blocking. In fact, looking at the rules for barette, I think the blog is wrong and what is in the video is actually proper rugby, all be it not 15-a-side (nothing changes, then!). I am back from holidays and finding your post. 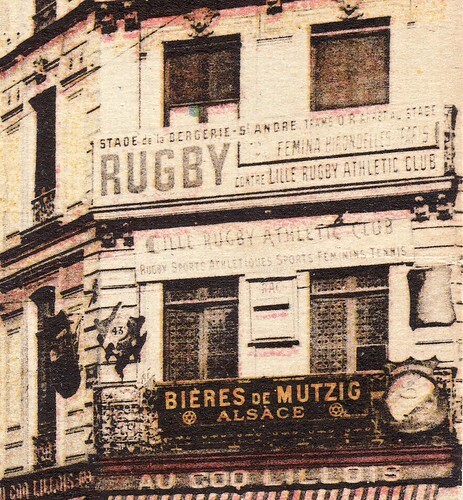 A rugby historian, actually teaching history of sports in Lille, recently explained me that French grils where playing a 10-a-side rugby in the 1920s, without tackling though allowing vigourous blocking as you said ! Match opportunity for U15s - and U12s! RFUW announce "Club Development Toolkit Fund"